Seems the boys are getting along very fine. 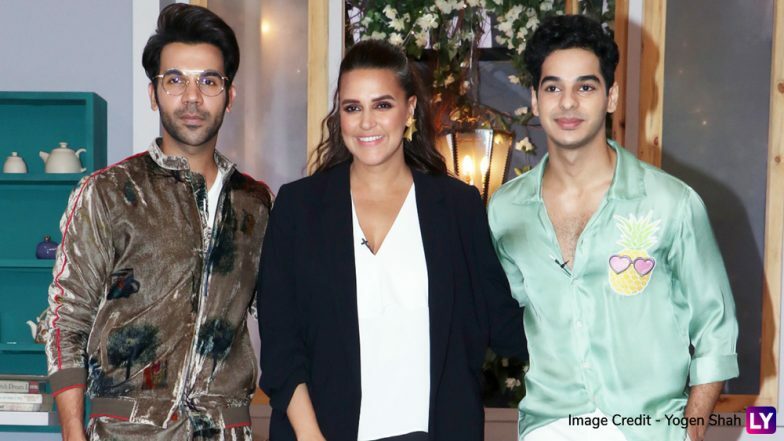 While Janhvi Kapoor and sister Khushi Kapoor kickstarted the new season of Vogue BFFs with Neha Dhupia, Rajkummar Rao and Ishaan Khatter were quick to join their league. The dapper men of Bollywood were clicked while shooting for this new episode and we wonder if Ms Kapoor was ever a part of their conversation. The show that's dedicated to best friends in the Bollywood industry has previously seen some well-known names like Shahid - Mira, Katrina - Alia and Deepika Padukone with sister Anisha Padukone share the couch. Janhvi Kapoor and Khushi Kapoor Look Uber Chic at They Kickstart Vogue BFFs Season 3. Remember the time when Janhvi Kapoor confessed having a crush on Rajkummar Rao? She's a huge fan of the Stree actor and the duo is even collaborating for a horror comedy, Rooh-Afza. We wonder if her rumoured boyfriend, Ishaan Khatter had a great time shooting with her crush and if the makers had any intention to get them on board purposely. Deepika Padukone Spilled Some Beans On Chat Show Vogue BFFs, Reveals Everything From Best Kisser To Favourite Cricketer. Janhvi Kapoor will kickstart season 3 with sister Khushi Kapoor and we can't wait to see their bond on the small screen. Apart from them, Sonali Bendre has shot for a very special episode with her besties Sussanne Khan and Gayatri Oberoi.